Mia had everything: a loving family a gorgeous, adoring boyfriend, and a bright future full of music and full of choices. Then, in an instant, almost all of that is taken from her. Caught between life and death, between a happy past and an unknowable future, Mia spends one critical day contemplating the only decision she has left — the most important decision she’ll ever make. Simultaneously tragic and hopeful, this is a romantic, riveting, and ultimately uplifitng story, about memory, music, living, dying, loving. I’ve heard so much about this novel, and I hated that it cost P700+ when I first saw it in Fully Booked Eastwood. When I saw cheaper versions of it in Fully Booked Fort, I knew I had to have it more than I wanted dip stations. Two weeks later, I read it in a day, and I finished with tears in my eyes and a heart that felt like bursting. When I was a kid, I used to watch TV shows whose storyline involve a the main character losing his/her parents because of an accident and their parents leaving a favorite toy, book or an item that would be a remembrance of the parents. After watching so many things like that, I started to become fearful of my parents’ well-being while they were out and I wasn’t with them. Cellphones are not the in thing then, so I have no way of getting in touch with them as I wait for them to arrive. Oftentimes, I’d end up crying with worry, calling their friends to know where they are and…well, generally making a fool of myself because of my fear. I felt the same kind of fear while I was reading If I Stay. It’s hard to write what I felt while I was reading it, but there were so many questions racing through my head, questions that I wonder about in real life as well. Like, do people who are close to dying know that they are about to say goodbye? What would I do if I was in Mia’s place? Can I choose to stay if I know I have lost a lot? 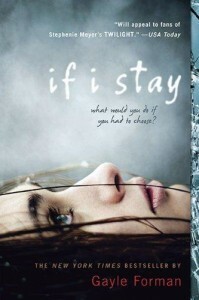 If I Stay doesn’t have the answers to those questions, but rather presses them on to the reader. The story starts off happy and carefree, and then Forman quickly plunges the readers into the heat of the action. As a reader, I felt Mia’s pain and confusion, and I learned to care for her deeply as I got to know her through her flashbacks. She’s not the most remarkable character once you got to know her past, save for her cello playing talent, but her pain and her choice makes her a strong character, one that resonates deeply with the readers even long after the book was finished. It’s not a comforting book, mind you, so don’t read it if you’re feeling down. Despite its slightly morbid theme of death, it is also a book of hope, one that encourage the reader to face life despite all its sadness and loss. I leave you with the part of the book that made me cry — skip this part if you don’t want to be spoiled because it may be a bit spoiler-y.